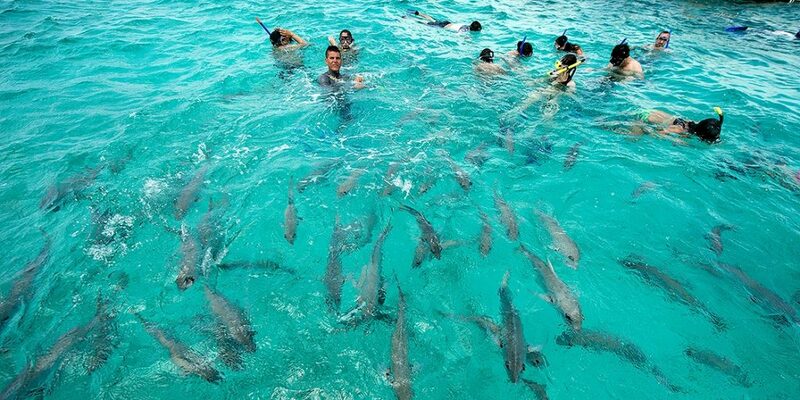 Belize offers a variety of adventure sports such as kayaking, cave tubing, windsurfing, zip lining, paddle boarding, ATV rentals, and parasailing. On Ambergris Caye parasailing, paragliding, jet skiing, tubing, waterskiing, wakeboarding and ski boats have long been popular due to the year-round warm water, gentle breezes, and smooth seas afforded by the sheltered sea coast. Another popular attraction on the island is a visit to Shark Ray Alley. For several years local fishermen often cleaned their catch just off the south tip of the island which attracted nurse sharks and southern sting rays. Today when the sharks and rays hear the boat they come in search of scraps of fish. These creatures have a great tolerance for divers and seem to enjoy the human interaction. Shark Ray Alley offers you the rare opportunity to scuba or snorkel besides string rays, nurse sharks and turtles. One company on the island offers guided tours to an area known as “Secret Beach” and a stop at the island where Leonardo di Caprio is building his ultra-green resort on Blackadore Caye.